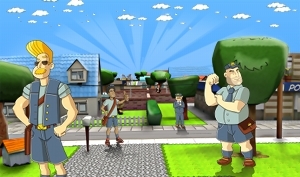 TouchArcade Review Gives Mailmen 4 Out of 5! TouchArcade has awarded Mailmen for iPad an incredible 4 out of 5 stars in its review! Here’s a quick quote from the informative article: “Mailmen is an entertaining game and a great addition to the iPad stealth library. The team-based gameplay and silly story simply makes for a title that’s an enjoyable experience. If you’re a fan of stealth game that requires planning and patience, you won’t be disappointed with Mailmen.” What are you waiting for? Sneak over to read the full review and see some cool screen visuals at TouchArcade! Enjoy Strategy and Stealth in Mailmen – Now Available! Mailmen launched today for iPad, and was chosen by Apple as a New & Noteworthy release! Press opinion of this hit stealth-strategy game has been great. App-Score says, “Mailmen is a fun game that people of all ages will enjoy. It’s extremely fun, humorous and engaging. I recommend this game to people of all ages and kinds.” NOTE – there is a slight glitch at the beginning of Level 3. We are going to release an update very soon to remove the glitch, but it can be avoided now by using the Mailman called Johnny to tie up the German Shepherd. Otherwise everything is working brilliantly – thanks and enjoy!